As a “marketer” by day, trend analysts have been telling us for years that we need to consider Hispanic Americans when we are planning because their presence in the United States continues to rise. In fact, according to the U.S. Census Bureau in 2007, 15 percent of the estimated total U.S. population of 301.6 is Hispanic. More and more bars in Chicago are piggybacking the popularity of Cinco de Mayo by creating specials around Dia de los Muertos. What exactly is this holiday? Dia de los Muertos, or for those non-Spanish speaking folk, “Day of the Dead,” is celebrated on the 1st and 2nd of November. The holiday celebrates friends and family members who have died. Groups of people typically get together and build a private altar to honor the deceased using sugar skulls and marigolds. The beverage of choice of the deceased is typically placed at the grave site as well. This holiday dates way back thousands of years to an Aztec festival to honor the goddess Mictecacihual (known as “The Lady of the Dead). 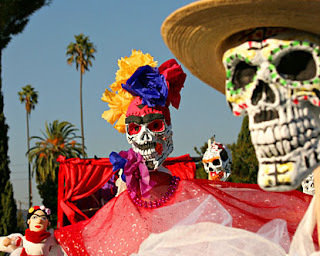 The more I research Dia de los Muertos, the more it creeps me out. The deaths of infants and children is celebrated on Nov. 1st, while adults are toasted on the 2nd. When people visit the children, they bring toys to their graves. Adults get some tequila. Ahhh tequila. The reason bars are trying to get this holiday going for us young folk. They want us to drink tequila year round – just not on Cinco de Mayo, in summer margaritas and Patron shots. Whatever way you decide to celebrate this weekend – just have fun and get drunk.